Over 30 members and guests met at St Thomas’s church centre on February 28 for a Civic Society discussion meeting on ‘Do we want HS2 in North East Derbyshire?’. Andrew Pritchard, representing East Midland Cities and Transport for the East Midlands, outlined the strategic case for the north-eastern leg of the high speed railway. Explaining the need for greater capacity for passenger services between London and major cities on the route, he emphasised that the proposed hub at Toton would be the most important station on the system outside London, bringing enormous employment benefits to that part of the region. Enhanced opportunities, especially for young people in the poorer areas of north-east Derbyshire, was a theme stressed by the Leader of Chesterfield Borough Council, Coun. Mrs Tricia Gilby. She mentioned the high quality skilled jobs that would be created, directly and indirectly, by HS2, and the scope to develop tourism by encouraging more visitors to come to Chesterfield by train. Coun. Gilby showed new architect’s drawings of the proposed remodelling of the station approach, including a large car-park, seamless integration with bus services, and a pedestrian walkway into the town centre. A note of caution was expressed by Glynn Waite, a railway consultant, who detailed the congestion on the existing Clay Cross–Sheffield line and showed how trains could be seriously delayed for any of several reasons. These included lack of capacity on the adjoining Dore–Chinley line and the poor track layout at Sheffield station. Mr Waite felt that these problems must be tackled before plans are made to run high speed trains on the Midland Main Line. Finally, Tony Mellors spoke on behalf of a community group in Blackwell and Newton, near Alfreton, opposed to the building of a link from the Erewash Valley line to Clay Cross, since this will sever communities in their area. Over 20 houses will have to be demolished, some only a few years old, which has already caused distress to longstanding local residents. Aided by slide showing a white elephant, Mr Mellors argued that HS2 was likely to cost much more than currently predicted and was a poor use of public money. The escalating cost of the project and questionable claims for the benefit-cost ratio were among the points raised during a lively discussion at the end of the meeting. In reply, Mr Pritchard pointed out that the north-eastern leg had the best commercial prospects of any part of HS2, and Coun. Gilby emphasised that the Borough Council’s ‘local labour’ clause in all its building contracts would ensure that jobs connected with HS2 came to the town. The society met at the St Thomas’ Centre for a talk by Paul Staniforth on Development Management and Conservation within the Borough. Although understandably this could cover only items within the public domain he managed to include the major town centre developments, and submitted affably to some fairly tough questioning, particularly on that perennial favourite topic, Chesterfield Market. He referred extensively to the list of heritage assets maintained by the Council, and details of this and other aspects of conservation can be found on the link at the bottom of the page. Paul’s talk was followed by the AGM. On Saturday we were at Chesterfield Museum for the annual Local History Fair. It was an excellent event, and we thank the Museum for hosting it. Here are a few photos from the day. As it was the first day of the Chatsworth Road Exhibition at the Museum we have reprinted the 1996 Brampton Trail booklet. Produced by the Brampton Living History Group and published by the Civic Society, full details can be found in the previous post. 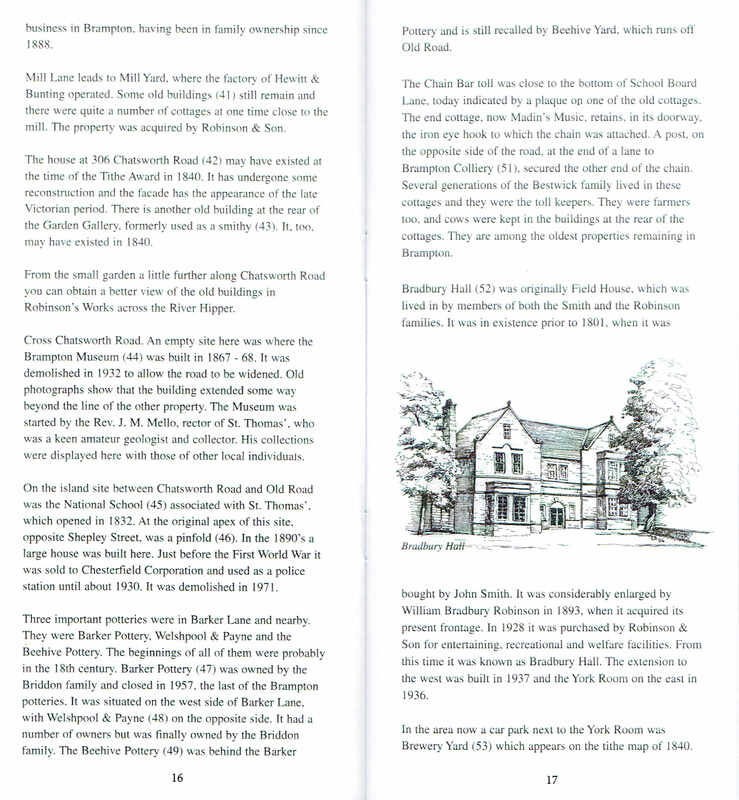 You can link to it directly by clicking on this picture of Bradbury Hall, one of the fine drawings in the guide. This little booklet was first published in 1996. In the succeeding 22 years, Brampton has changed beyond recognition. Nevertheless, much still remains, and the trail is a valuable guide to the area, while the illustrations are reminder of what has now gone. The Civic Society has republished it with a new preface by Philip Riden to coincide with the current Chatsworth Road exhibition in Chesterfield Museum. It is priced at £3, and copies will be available for purchase at the AGM. Click on the specimen pages to see them at full size. The Derbyshire Times has published a comprehensive report on the history of Hurst House and the CSF in this week’s paper. To quote our Chairman it is an ‘excellent piece’. For many years the future of Wentworth Woodhouse has been uncertain. The recent acquisition by the Wentworth Woodhouse Preservation Trust, and a substantial restoration grant from the Government has hopefully secured its future. On Tuesday 24th July members of the Society took advantage of the recent opening of the property to the public and visited for a conducted tour of the State Rooms. As befits the largest privately owned residence in the UK, they are magnificent. A selection of photographs from the day can be seen in the gallery below. Click on any photo to enlarge it. Further details of Wentworth Woodhouse and visiting can be found here . The Civic Society had a stand at the fair at the fair on Saturday on what turned out to be a very well-attended day, despite the feared competition from the Royal wedding. Our Chairman had a useful introduction and discussion with the new Mayor of Chesterfield, and also managed to oversee the Victoria County History and Derbyshire Record Society tables. Well known , both to Chesterfield residents and further afield as a characteristic image of Chesterfield , the Black and White frontage of Knifesmithgate is well worthy of preservation . Currently however , the upper floors are empty , and their future unknown. The issue is that the building belongs to a London property management company, and nothing is known of their plans . Thank you Eileen for these memories of the ‘Vic’ as we all called the Victoria Ballroom . She captures the central part it played in our lives for those of us who grew up in the 1960s . Just click on the link below the photo to read the full story .